This one’s for developers. Whether you’re working on your first app, thinking about making an app, or you’ve been at it for a while, you know that app rejection is one of the things you have to worry about. 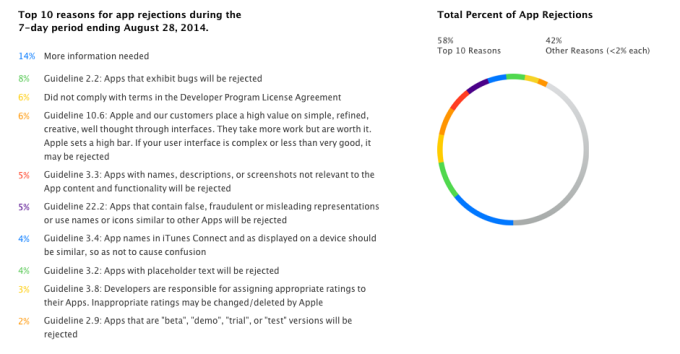 Apple has never been easy when it comes to approving apps for its Store, and now, they have released the top reasons for app rejection. As can be expected, the onus is on developers to make sure their apps get approved and doesn’t get thrown in the app rejection bucket. The page, titled Common App Rejections, starts off with the goal: to highlight some of the most common issues why apps get rejected so that developers can be aware of them and be better prepared before submitting apps for review. Here’s a short version of the list, courtesy of TechCrunch. As TechCrunch highlights, two common reasons are too broad to be of much use to developers. “More information needed”tops the list, which pretty much could cover anything – unless Apple actually lets the developer know what the needed information is. 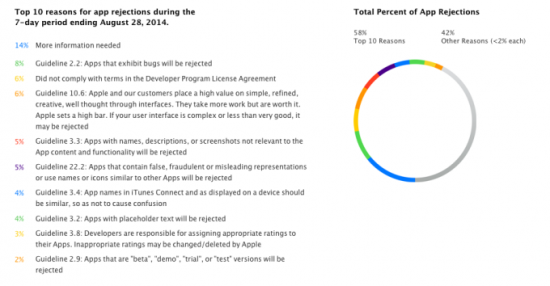 “Did not comply with terms in the Developer Program License Agreement” – the third most common reason – is just as unspecific, as who knows which part of the terms the app does not comply with? In any case, if you’re on your way to submitting an app to Apple, make sure you go through the page and decrease your chances of getting rejected. Pixlr for Desktop Is Here, and It’s Free!